Kutnohorite is a rare calcium manganese carbonate mineral with magnesium and iron that is a member of the dolomite group. 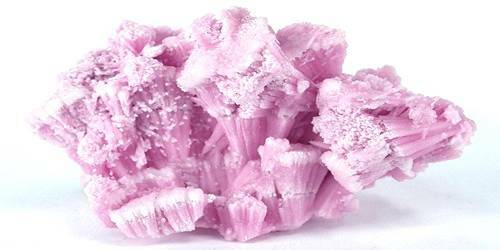 It is a rare calcium manganese magnesium iron carbonate mineral with trigonal crystals, having a white, pink or brown color. It is a member of the dolomite group and is difficult to distinguish from dolomite except for the increased density in kutnohorite. It forms a series with dolomite, and with ankerite. Kutnohorite is named after its type locality which is near Kutna Hora in the Czech Republic. It was named by Professor Bukowsky in 1901 after the type locality of Kutná Hora, Bohemia, in the Czech Republic. Color: White, pale pink or light brown. Kutnohorite may be white, pale pink or light brown. The pink shades are due to increased manganese and the brown colors are due to increased iron content. The mineral is translucent with a white to pale pink streak and vitreous to dull luster. It has perfect rhombohedral cleavage, typical of carbonates. It is brittle with a subconchoidal fracture and it is quite soft, with hardness 3.5 to 4, between calcite and fluorite. Specific gravity is 3.12, denser than both dolomite and calcite. It is soluble in acids, as are all carbonates. Occurrence – Typically in deposits associated with manganiferous sediments. Kutnohorite occurs typically in manganiferous sediments, associated with rhodochrosite, aragonite, and calcite. Notable occurrences include Tuscany, Italy and Kutná Hora, Czech Republic. Localities for kutnohorite include in, additionally, Sweden, Italy, the United States, Canada, Mexico, South Africa, Japan, and Australia, among several others. 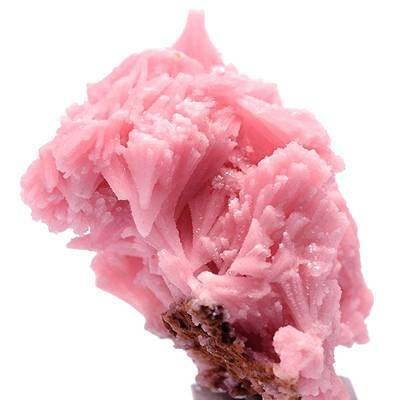 Associated minerals include rhodochrosite, aragonite, and calcite.